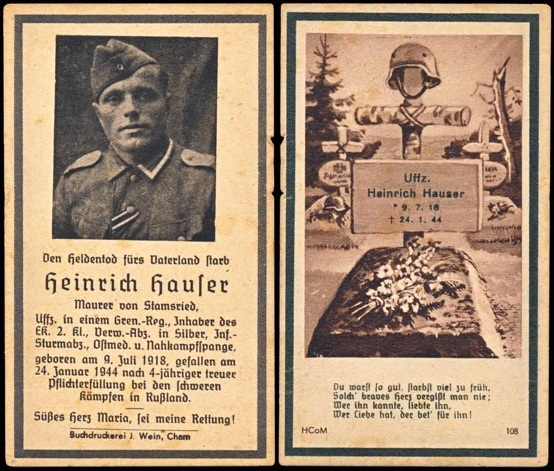 WW2 German Death Card (Sterbebild) for Army Unteroffizier Heinrich Hauser, Grenadier Regiment. Was awarded the Iron Cross 2nd Class, Silver Wound badge, Infantry Assault Badge, Russian Front Medal and Close Combat Clasp. After 4 years true service, he was killed in the difficult fighting in Russia, 24 January 1944. He was 25. The single page single sided card measures about 5.5 x 4.25 inches. Includes a German Graves Office slip listing him as being killed and buried by Wollewowo Leningrad, Russia. Scan exaggerates color. OK condition. 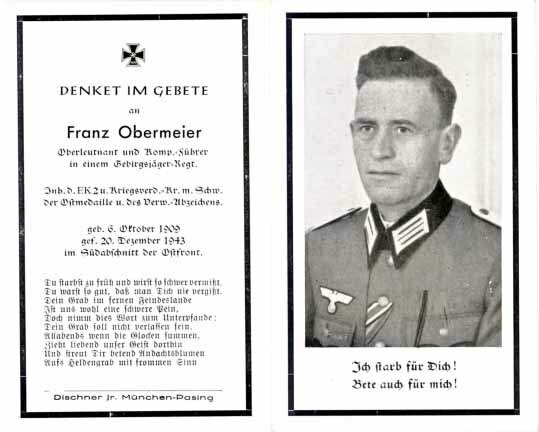 WW2 German Death Card (Sterbebild) for Army Oberleutnant and Company Commander Franz Obermeier, Gebirgsjaeger Regiment. Was awarded the Iron Cross 2nd Class, War Service Cross with Swords, Russian Front Medal and Wound Badge. Killed in the southern sector of the East Front, 20 December 1943. He was 34. Nice photo with the Iron Cross and Russian Front Medal ribbons. The single page double sided card measures about 5.25 x 2.5 inches. 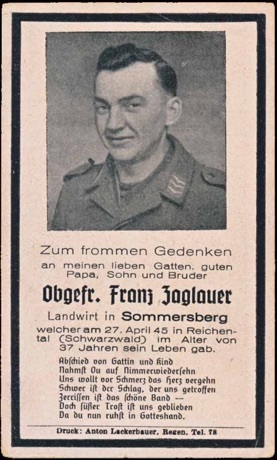 WW2 German Death Card (Sterbebild) for Army Oberzahlmeister and Fahnenjunker Alfred Füessl, Infantry Regiment. Salesman from Wallersdorf. Died in a Russian POW Camp hospital, 17 October 1945. He was 37. Back of card has a cross. The double page double sided card measures about 3 x 5.5 inches. Includes a German Graves Office slip stating he died in Karachasch, Ukraine. 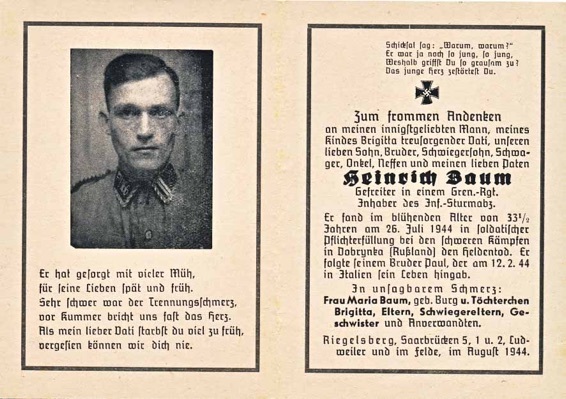 WW2 German Death Card (Sterbebild) for Army Captain and Unit Commander Rudi Emmelhainz, Artillery Regiment. Card has a testament to him. Was awarded the Iron Cross 2nd Class, Iron Cross 1st Class and the Narvik Shield. After being in combat in Northern Norway, Yugoslavia and against the Russians in the Eastern Ukraine, he was killed 16 October 1941. His grave was in a group of pines, in the Eastern Ukraine. It says not only his unit but the regiment and the division knew his name and has suffered a loss. 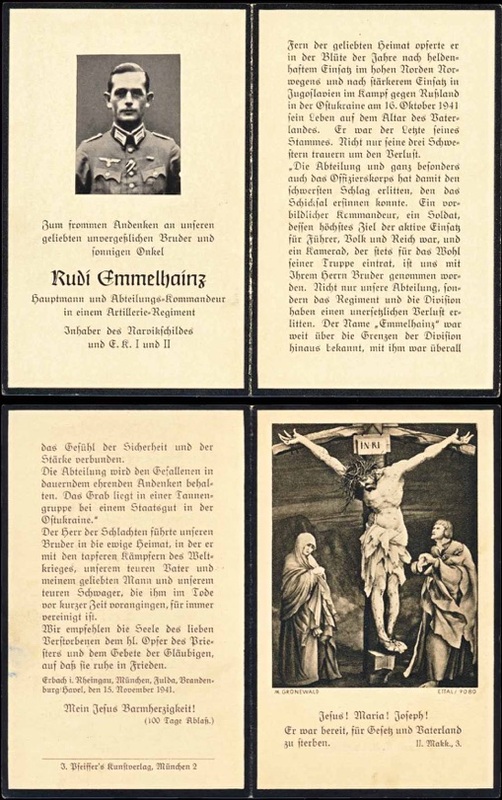 The double page double sided card measures about 6 x 4.5 inches. WW2 German Death Card (Sterbebild) for Army Gefreiter and NSKK Mann Heinrich Baum, Grenadier Regiment. Was awarded the Infantry Assault Badge. Killed in the difficult fighting at Dobrynka, Russia, 26 June 1944. He was 33. He joined his brother, Paul, in death who had been killed in Italy, 12 February 1944. Nice photo in NSKK uniform. His collar tab looks to be 29-166. The double page single sided card measures about 6.5 x 4.5 inches. The back of the card has a photo of a funeral. 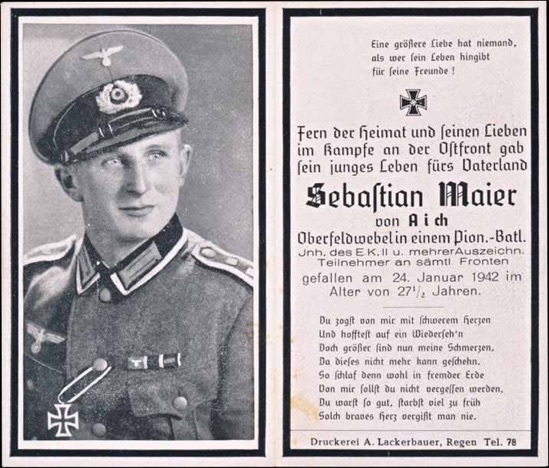 WW2 German Death Card (Sterbebild) for Army Oberfeldwebel Sebastian Maier, Pionier Bataillon. Was awarded the Iron Cross 2nd Class and more awards. (Photo has him wearing the newly awarded EK2 and the Long Service Medal ribbon bar, Austrian Anschluss ribbon bar and the Czech Anschluss with Prag Bar ribbon. Fought on all fronts. Back of card has Jesus. The double page single sided card measures about 4.5 x 4.75 inches. 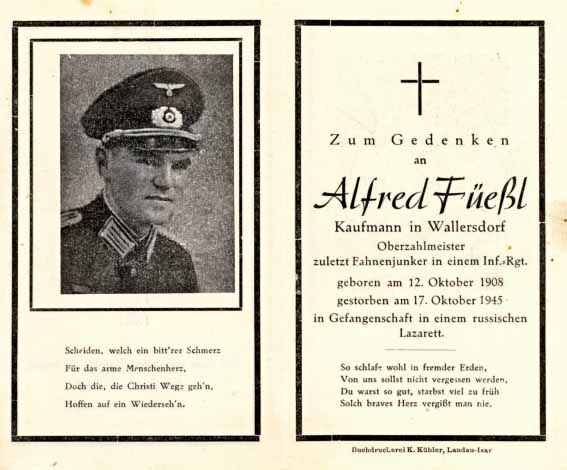 WW2 German Death Card (Sterbebild) for Luftwaffe Obergefreiter Franz Zaglauer. Farmer from Sommersberg. Killed 27 April 1945 in Reichental, Black Forest. He was 37. Back of card has a rendering or a grave. The single page single sided card measures about 2.5 x 4.5 inches. Includes a German Graves Office slip stating he was buried in Gernsbach Reichental, Germany.